Blyth Spartans manager Tom Wade was full of praise for his players following their 2-0 win at Mickleover Sports on Tuesday. “It was a typical, spirited Blyth Spartans-style performance,” he said. “We were well on top in the early stages, creating chances and forcing their keeper into making some good saves. “It seemed only a matter of time till we scored, but then [Nathan] Buddle was sent off. “I couldn’t believe it as he clearly won the ball cleanly. The lads went ballistic. “We had to dig deep, re-group and batten down the hatches. We did it impressively with excellent performances from all the lads who worked their socks off. “We had three of four chances to get a second goal before Aaron [Wearmouth] tucked the ball home just before the end. 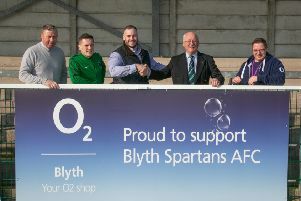 The Blyth boss was keen to thank the Spartans fans on behalf of the team and himself. “The away support was superb. They were noisy all game, singing their hearts out. Just brilliant,” he said.